Duque wants to raise taxes on Colombia's middle class and poor; will congress let him? Duque wants to raise taxes on Colombia’s middle class and poor; will congress let him? The government of Colombia’s President Ivan Duque wants to raise income tax on the middle class and introduce sales tax on basic food products, and on Tuesday called this a “progressive” tax bill. Finance Minister Alberto Carrasquilla formally presented the tax bill before Congress on Wednesday, where it is likely to receive fierce opposition. The tax bill includes the introduction of a 19% sales tax on basic food products, which is highly controversial; many of Colombia’s poor already don’t have enough money for food, basic food products have traditionally been exempt from sales taxes. Furthermore, Duque and Carrasquilla want to lower the threshold for for income tax for low-income workers earning more than $623 (COP1.9 million) per month. Until now, only the middle class and the upper class, people earning more than $1,200 (COP3.7 million), must pay income tax. While taxes for the poor go up, income tax for middle and upper earners are lowered from 37% to 33% and corporate income tax will be lowered from 35% to 30%. 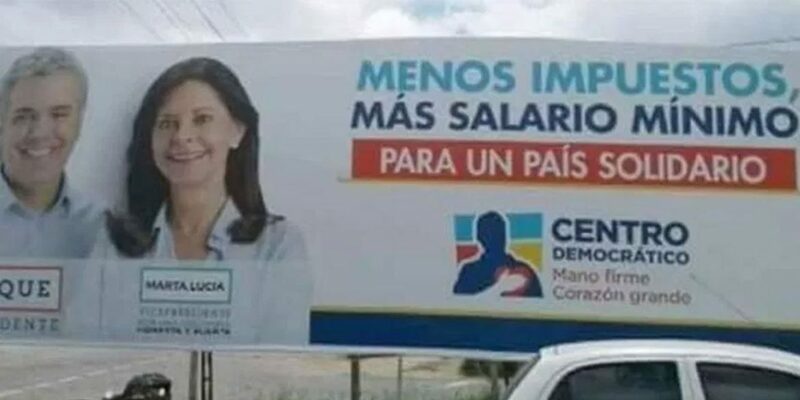 “This is a progressive law that means those Colombians who have more income will contribute at a higher rate for state financing and the redistribution of wealth,” Carrasquilla told press without a whiff of irony on Wednesday. The tax plans seem contrary to the advise of both the World Trade Organization (WTO) and the IMF. To prevent an increase in poverty levels, the VAT increase will be compensated by transfers of the government” to lower-income people, Banco Davivienda senior economist Andres Langebaek told Bloomberg. Nevertheless, “the impact on the middle class could be important and could hamper growth,” said Langebaeck. “The middle classes and lower-middle classes are the ones who are hit the most,” economics professor Jorge Restrepo of the elite Javeriana University told Bloomberg. But Carrasquilla needs money to close the country’s budget deficit and, by taxing the poor and lower-income households, believes he can add $4.37 billion (COP14 trillion) to the government’s revenue while benefiting the rich and the country’s corporations. The centrist Liberal Party, which declared itself “independent” of the government, said it would not support the tax reform. The conservative Radical Change party said it would also not support the tax reform, leaving its future highly uncertain.